Along with various ritual preparations for counting down the days to Epiphany, discussed in a previous post, the Feast of the Adoration of the Magi on January 6 offers plenty of ritual to be performed on the day itself. As such, this post exists to highlight options for devotional and magical works of Epiphany itself; and hopefully presenting them with enough time for folks to make sure they are set to be able to achieve them. So I present three gifts: a very traditional materia; the famous later-but-now-also-traditional blessing of the threshold; and a new talisman from my personal practice and experiments. January 6 has not always been chiefly associated with the Magi and their Adoration. From the second century CE, it was mostly celebrated as the date of the baptism of Jesus by John in the Jordan. There are a wealth of other watery associations for the date - from pre-Christian Nile blessings to the miracle of the water into wine at the marriage in Cana in the Nazarene's own life, to the later Byzantine 'Feast of Lights' - which are detailed in my upcoming book on the Magi and their history, myth, and ritual. So consider making time on Epiphany to visit your local church and collect holy water, perhaps even combining this with a Mass - either having it on one's person during or collecting the water afterwards. 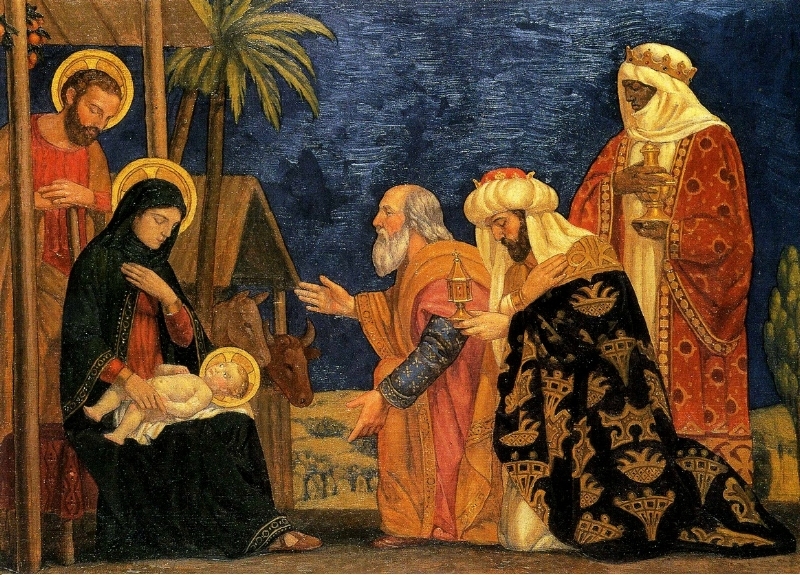 If you do not yet have a local church, perhaps Epiphany is a good time to find one. A short note on collecting holy water. Some modern magicians and witches seem to consider that the collection of holy water from a church must necessarily be a thing of secret, subterfuge, and larceny. While the theft of various materials from a church can indeed be a potent empowerment of said materia, it should also be noted that this is not a requirement. Nor is it my personal experience of any Italian-American Catholic church I have visited, although obviously this may vary from parish to parish. I have consistently found that priests and parishioners alike are delighted that you take away and employ holy water. It is for using after all, about the home and elsewhere, and has plenty of applications that do not require you to explain your sorcerous endeavours to strangers or clergy. Perhaps the most famous folk magical custom associated with the Three Holy Kings is the marking of the top of one's front door with the C + M + B formula. Rather than rehash everything written about this simple yet effective blessing, I present three links (because of course three) well worth studying. Either on Twelfth Night (January 5), the twelfth day of Christmastide and eve of the feast of the Epiphany, or on Epiphany Day (January 6) itself, many Christians (including Anglicans, Lutherans, Methodists, Presbyterians and Roman Catholics, among others) chalk their doors with a pattern such as this, "20 † C † M † B † 12", with the numbers referring "to the calendar year (20 and 12, for instance, for the year 2012); the crosses stand for Christ; and the letters have a two-fold significance: C, M, and B are the initials for the traditional names of the Magi (Caspar, Melchior, and Balthasar), but they are also an abbreviation of the Latin blessing Christus mansionem benedicat, which means, May Christ bless this house." In some localities, but not in all, the chalk used to write the Epiphanytide pattern is blessed by a Christian priest or minister on Epiphany Day; Christians then take the chalk home and use it to write the pattern. This Christian custom of chalking the door has a biblical precedent as the Israelites in the Old Testament marked their doors in order to be saved from death; likewise, the Epiphanytide practice serves to protect Christian homes from evil spirits until the next Epiphany Day, at which time the custom is repeated. Families also perform this act because it represents the hospitality of the Holy Family to the Magi (and all Gentiles); it thus serves as a house blessing to invite the presence of God in one's home. Firstly, Jason Miller of Strategic Sorcery introduces the tradition nicely here as well as very thoughtfully presenting the recipe for the delightful Three Wise Men cocktail! Secondly, this page offers prayers to be said while chalking the C + M + B, with a responsively arranged blessing for conducting the ceremony with the other members of your household. Finally, I present the Catholic rites of the blessings of the chalk itself as well as prayers for the act of the chalking, presented by the Order of Carmelites. As an additional "bonus empowerment", consider making your own magical chalk, as detailed in this great post from Conjureman Ali. These instructions include adding a pinch of herbal materia, and you should feel confident in employing your familiar plant allies that accord with the mysteries of this house and threshold blessing: to begin the year afresh, protected each time one journeys out of one's home and purified each time one returns. I have used the Three Purifiers of the Grimorium Verum (that is, marjoram, mint, and rosemary) about which I have held forth at length in my article for the second Conjure Codex by Hadean Press. Other herbs of the Magi include hyssop, rue and anise. These could be added in very small dried quantities or even infused in Triple-Kings Water to be added to the dry chalk mix. One might also employ (sparingly!) frankincense and/or myrrh essential oil/s. Take three pieces of chalk and baptise them in the names of the Three Kings with holy water, with Three Kings Water being best. Grind them to dust with blessed salt. Add a small amount of infusion of rue, as well as frankincense and myrrh oils. Shape the wet mass into three sticks of new Three Kings chalk. Consecrate. Pray a Blessing of the Chalk. Finally, I present this devotional charm which developed from both my research into the history, folklore and cultus of the Three Holy Kings, and my own practice, supported and verified by divination and spiritwork. On Epiphany, take a white silk bag and place inside gold, frankincense and myrrh. As you place these items in the bag, declare: as the Magi adored the Christ Child, so are these gifts given to the glory of Son known by the Star in the East. Pray. Invoke and cross + CASPAR + BALZATHAR + MELCHIOR + Tie it shut and hang three king charms from the knot. Smoke it in Three Kings incense and feed it Three Kings oil. You now have a talismanic representation of the authority of the Anointed One as well as a Star to call the Magi. The king charms mentioned can be crown charms, or could be elaborately carved king figurines, or even small Christmas tree decorations of the kings. For various reasons I prefer using king chess-piece charms. Three Kings incenses and oils can be found at many botanicas - and you should of course be supporting your good local folk magic shops! The essential features of the bag are of course the Three Gifts: I recommend you do your own research into as many significances of gold, frankincense, and myrrh as you can find. Scriptural, pre-Christian, historical, economic, cultural, magical, medical, mythic, environmental. Consider the research itself a devotional journey - an ongoing unfolding pilgrimage with no fixed destination, but a continual set of footnotes left following your Star of inspiration and promise of Light in the Darkness.